Building FIVE, of which EBM Expert was the project architect, and where EBM Group is based, has achieved another award after its success in the competition ,,Building of the Year 2017″. BuIlding FIVE was given second place in the category New Administration Centre in the competition ,,Best of Realty 2017″. The project was particularly praised for its conversion into offices from its former use as a tram depot in Prague – Smichov. 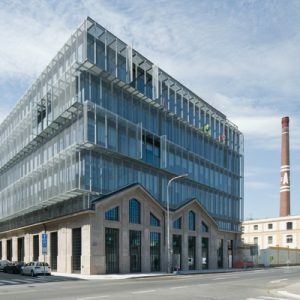 The project proves that the office building, with use of the latest technologies could still respect the specific atmosphere of the site and contribute to the growth of a uniqe location, like this one. The award in the competition ,,Best of Realty 2017″ in category ,,Award of Readers” was given to project Residence Waltrovka where EBM Expert contributed to the finalization work.